*All scripture quotations are from the English Standard Version. Tuesday, May 13th: O Wretched Man! This week asks a primary question. If Christ is the end of the law, does the law remain as a binding practice for Christians, or has the law been terminated? This week begins with the author making an assumption, that keeping the law is what Christians are supposed to do. … all throughout the New Testament we have been shown the only way to achieve immortality, and that is through faith in Jesus as opposed to the keeping of the law—even though we are to keep it. Indeed, obeying the law is not in conflict with grace; on the contrary, it’s what we’re supposed to do as a result of receiving grace. ~ Sabbath School Quarterly, pg. 56. The formula in this passage specifically refers to the seventh-day Sabbath in “days” “months” “seasons” “years”. It is a formula found throughout scripture both Old and New Testament. Other than this there is nothing else to comment on in the first lesson for this week. 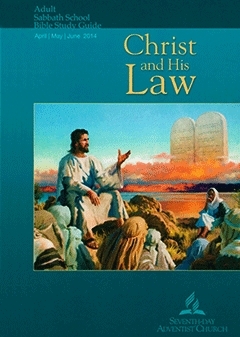 The lesson author specifically states that the ten commandment law had not been given to Adam and Eve. This is contrary to Adventist teaching. Ellen G. White stated that the ten commandment law had been given to Adam and Eve before their infraction of eating the forbidden fruit. The law of God existed before man was created. The angels were governed by it. … Adam taught his descendants the law of God, which law was handed down to the faithful through successive generations. … The law was preserved by Noah and his family, who for right-doing were saved in the ark by a miracle of God. Noah taught his descendants the ten commandments. The Lord preserved a people for himself from Adam down, in whose hearts was his law. ~ The Spirit of Prophecy, Vol. 1, 1870, pp. 261, 262. Our loyalty to God in obeying, in spirit and letter, the ten commandments, reveals to the world, to angels, and to men, our covenant relation with Him. Adam and Eve were to glorify God by personal and perpetual obedience to His law, and it is in this way that we are to give God glory for all entrusted gifts. We are to love God supremely and our neighbor as ourselves. ~ Ellen G. White, Manuscript Releases, Vol. 18, pg. 1. Adventism has always taught that Adam and Eve were given the ten commandment law while in the garden of Eden. This lesson author is not a very good student of Ellen White and her teachings. Today’s lesson centers around a few verses in Romans 6:15-23 about Paul’s struggle with sin that reigns in his body, while he serves the law of God with his mind (v.25). It is Christ who has elevated the law to something more than outward displays of righteous acts; he has shown that simply thinking about a sin is to have committed that sin. This must mean that the law is not binding for Christian life and practice. Sins dominion has been defeated, and we are now under grace, not under law. [W]hen Paul tells Christians not to sin, He is basically telling them: keep the law, obey the commandments! Notice the tenses of the words in Hebrews 10:14. “perfected” is past tense while “being sanctified” is an ongoing action. Why is it so easy to get caught up in the faulty logic that says that because we are not saved by the law, we no longer have to obey it? Teacher’s Quarterly pg. 79. This is a faulty question. We are no longer under the law, yet we are under a higher standard set by Christ himself. To point back to the law is to mislead one into believing that it is “either/or”, either we keep the law, or we don’t. The lesson author does not go to the New Testament teachings which surpass the law in glory, as the glory of the law has faded away. This means that the law has no glory at all, for it has been surpassed by something that is permanent. Even when the law did have glory, one was still saved only by grace through faith, not by the keeping of any set of laws. God’s grace remains constant, it is the outward practices that have passed from glory. Grace and the law are not contraries; they do not negate each other. The lesson author asks the student to read Romans 7:13-25. He then goes on to explain that theologians have, for centuries, debated about whether this passage is about Paul before his conversion or after his conversion. It must be about Paul as a Christian, as the power of grace in his life to do the good, is something that non-Christians do not experience unless convicted by the Holy Spirit. For the person who lives in the Spirit, the ever-present law serves as a constant reminder that deliverance from condemnation comes through Jesus (Rom. 7:24–8:2). The law was ineffective, not because it was too high a standard of righteousness, but because it was weakened by the flesh. It is Jesus that condemns sin in the flesh for the Christian, not the law. Read Romans 9:30–10:4. How is Paul explaining here how salvation is by faith and not by the law? For Moses writes about the righteousness that is based on the law, that the person who does the commandments shall live by them. 6 But the righteousness based on faith says, "Do not say in your heart, 'Who will ascend into heaven?'" (that is, to bring Christ down) 7 or "'Who will descend into the abyss?'" (that is, to bring Christ up from the dead). 8 But what does it say? "The word is near you, in your mouth and in your heart" (that is, the word of faith that we proclaim); 9 because, if you confess with your mouth that Jesus is Lord and believe in your heart that God raised him from the dead, you will be saved. 10 For with the heart one believes and is justified, and with the mouth one confesses and is saved. 11 For the Scripture says, "Everyone who believes in him will not be put to shame." 12 For there is no distinction between Jew and Greek; for the same Lord is Lord of all, bestowing his riches on all who call on him. 13 For "everyone who calls on the name of the Lord will be saved." Paul describes Christ as the “end” of the law. He is not the “end” in the sense of terminating the law, but in the sense of being the “goal” of the law, the One to whom the law points. The law leads a person to Christ. Here we clearly see that the Law is something that came into existence about 430 years after Abraham, and lasted until the offspring (Jesus) should come. The law had a termination point, when the offspring should come to whom the promise had been made. In other words, the law was in effect until Christ came and redeemed those who are under the law. The law reminds all Christians that Christ is our righteousness (Rom. 10:4). Quite the contrary; the law, if understood properly by a sinner, would leave that one despondent, hopeless and depressed. The law does not remind us that Christ is our righteousness, it reminds us of how sinful we really are and how hopeless is our situation. Once a person is in a state of despair over his condition, then Christ is introduced as the only hope of salvation from sin and sinfulness. If we use the law properly, we bring a “ministry of death” (2 Cor. 3:7) to the sinner. Then we bring the good news of Jesus Christ as our savior, the one who lifts us up and gives us a hope and a future. This is a ministry of life. The lesson author gives a good overview of a passage of scripture, Galatians 3:19-24. He correctly identifies the role of the law as the schoolmaster that leads us to Christ. In light of the explanation of the role of the tutor, what do you think is the purpose of the law for someone who has received salvation in Christ? Similarly, while the Christian is not under the condemning power of the law, as a person who has attained maturity, he or she is expected to govern his or her actions in accordance with the principles of the law. For God has done what the law, weakened by the flesh, could not do. By sending his own Son in the likeness of sinful flesh and for sin, he condemned sin in the flesh, 4 in order that the righteous requirement of the law might be fulfilled in us, who walk not according to the flesh but according to the Spirit. 5 For those who live according to the flesh set their minds on the things of the flesh, but those who live according to the Spirit set their minds on the things of the Spirit. Notice that the law was “weakened by the flesh.” That is because living according to the law is living according to the flesh. It is living in light of the letters engraved on stone, not the righteousness of faith in Christ and the leading of the Holy Spirit. Nor is it living in light of the promises made to Abraham, which promises extend to the Gentiles, not only to the descendants of Abraham, who eventually became the Jews. Its [the Laws] prohibitions are the sure guarantee of happiness in obedience. As received in Christ, it works in us the purity of character that will bring joy to us through eternal ages. ~ Selected Messages, book 1, pp. 234, 235. The laws are not the “sure guarantee of happiness.” Only the Holy Spirit brings joy to a Christians life, in light of all that Jesus has done for us on the cross. Throughout the week the lesson author has done a good job of explaining that the law was to guide us to Christ, in whom we have forgiveness of sins. However, he constantly points back to the law as a way to live out the Christian life. Always remember that the Holy Spirit is the one who convicts of sin, brings about repentance and leads the believer to live a Christ-like life. It is no longer the function of the law to teach us how to live. If we live according to the law, we are living according to the flesh and the letter, not according to the Spirit. We are living according to that which has surpassed the glory of the law, which (the law) has faded away from having glory. Copyright 2014 BibleStudiesForAdventists.com. All rights reserved. Revised April 29, 2014. This website is published by Life Assurance Ministries, Camp Verde, Arizona, USA, the publisher of Proclamation! Magazine. Contact email: BibleStudiesForAdventists@gmail.com.